A high quality fridge filter, like the LG LT700P model (also known as the ADQ36006101), uses a block of activated carbon to remove impurities from the water, like lead, mercury, cysts, benzene, chlorine, and turbidity. As the water passes through the filter, these particulates are captured, delivering healthy, clean, great-tasting water to your refrigerator and ice maker. Your drinks will taste better with the LT700P / ADQ36006101 fridge filter. Discount Filters carries two models of the ADQ36006101 filter - the OEM LG LT700P and the aftermarket model, ClearChoice CLCH106. The LT700P is NSF-rated 42 and 53, so it's certified to remove the taste of smell and chlorine, lead, mercury, and other contaminates. 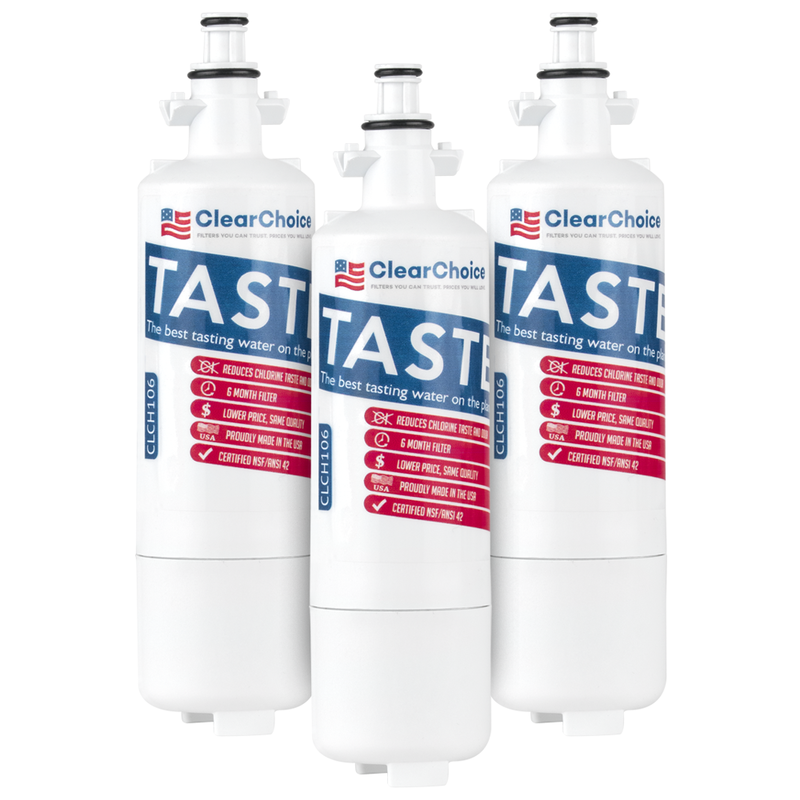 The aftermarket model by Clearchoice is 100% compatible with the OEM adq36006101 model, providing the same excellent filtration at a fraction of the price. Both filters come with a one-year satisfaction guarantee. Discount Filters offers free shipping and returns on all orders. For optimal performance, these filters should be changed at least every six months or 200 gallons, whichever comes first. You should consult with your owner's manual to determine the frequency of the filter change and other manufacturer recommendations. Other replacement models include ADQ36006102, 9690, 469690, ADQ36006101-S, WSL-3 and the SGF-LA07. All of our discount fridge filters come with free shipping and returns. *Tip: It is normal for a small amount of water to drip when replacing your filter. Have a dish towel handy when changing your filter. 52 compatible alternative filter models below. Marvel at the specifications of our ADQ36006101 compatible filters. 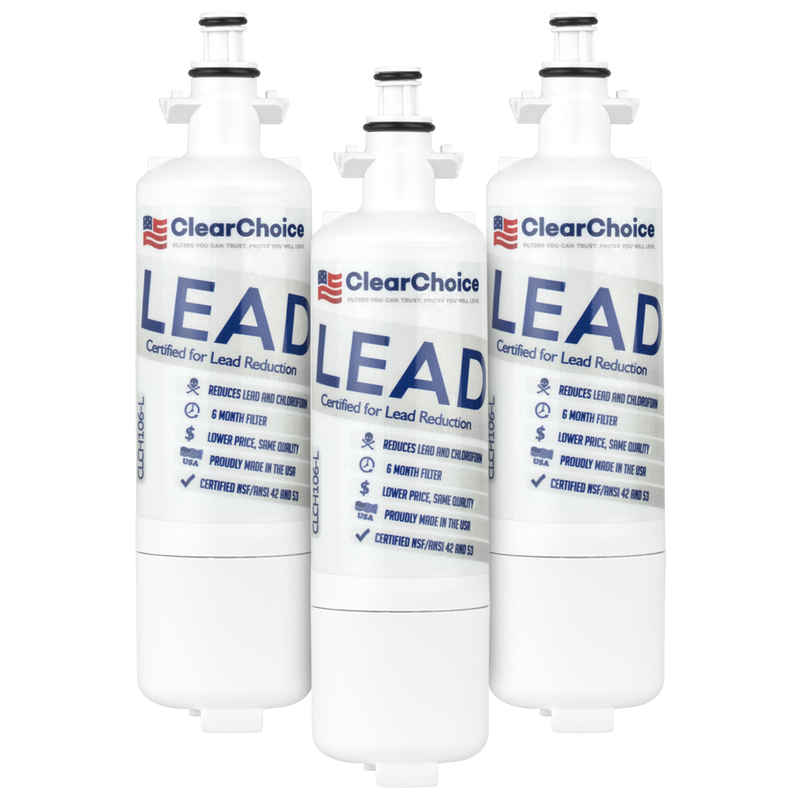 The factory original LG LT700P and the compatible aftermarket Clearchoice CLCH106 both replace the LG ADQ36006101 filter and both reduce contaminants found in your water supply, including dirt, chlorine taste and smell. The LG LT700P has NSF/ANSI ratings of 42 and 53, meaning it has been certified to reduce multiple contaminants in tap water. The ClearChoice CLCH106 has many of the same attributes as the OEM. The filtering capacity, flow rate, pressure range, and operating temperature is the same as the OEM's. The primary difference between the OEM and aftermarket filter is price and NSF/ANSI Standard certifications, though some filters that are not NSF/ANSI rated are still constructed from NSF/ANSI rated parts. 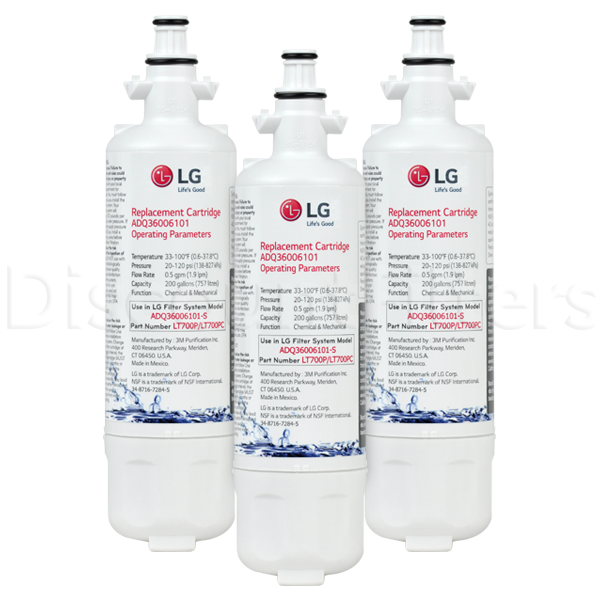 Buy the discounted LG refrigerator water filter today and enjoy free shipping and free returns if you're not completely satisfied. Quick and easy installation and they do a great job of keeping my water sweet tasting and smelling clean. Replaced the OEM filter in my Kenmore/LG fridge. This fliter seems to be less restrictive and improves the flow rate.